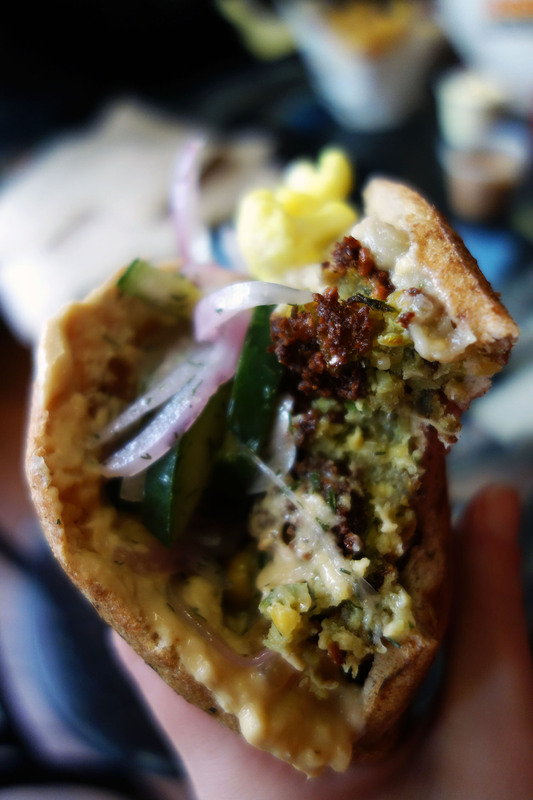 There are times when all one needs is a palmful of pita overflowing with crumbly, crunch and creamy things. This past Thursday marked my 25th birthday and the first significant blizzard D.C. has seen since I moved here. Though I ended up with an extra day off, my best friend’s visit was mucked and muddled up by the downpour of sleety wet sludge and we were left snowed in on a day that was meant to be spent gallivanting around town. I woke up jaded and hungry. I wanted sauce to drip down my fingers like the warm blood of some helpless prey I had just slaughtered in lust and hunger. I got that at Amsterdam Falafelshop. I called and confirmed that they were open before we trudged out through the un-paved, un-salted, stupid Southern streets to Adams Morgan. 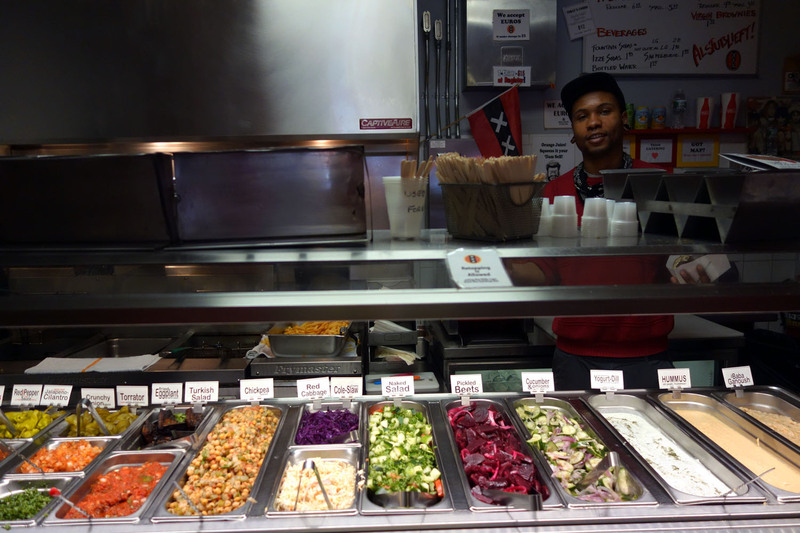 I had heard good things from good people about the quality and variety at this place, and had been eager to try it out. Granted, it’s a bit of a late-night spot, a healthier alternative to the poisonous yet life-sustaining Jumbo Slice, but visiting during the day seemed more respectful. Plus, something told me it would hold up without whiskey directly preceding it. The rules are pretty clear. 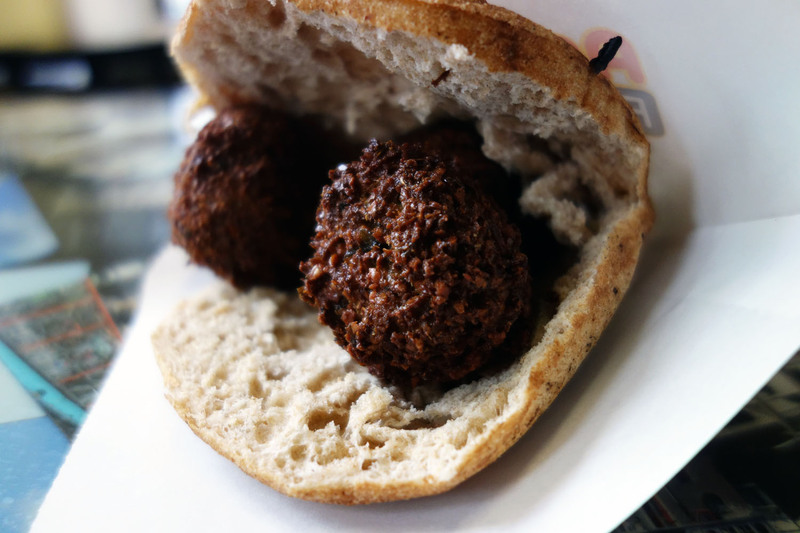 A small pita with 3 balls of falafel or a slightly larger pita with 5 balls of falafel. White or wheat. Add directly to your sandwich from the vibrant array of toppings to your heart’s content, but only once before being limited to small sample cups for re-fills. There are also fries served Belgian-style: in a sloppy cone from which they topple over and hit the ground hard. This brings me to my only objection to the experience. People – especially people after 2 a.m – should receive trays on which to carry their loaded falafels and fries to their table without losing half of their hard-earned meal, as we did completely sober. There are holes in the table to stick cones through though, so I guess that’s pretty convenient. The toppings rock. 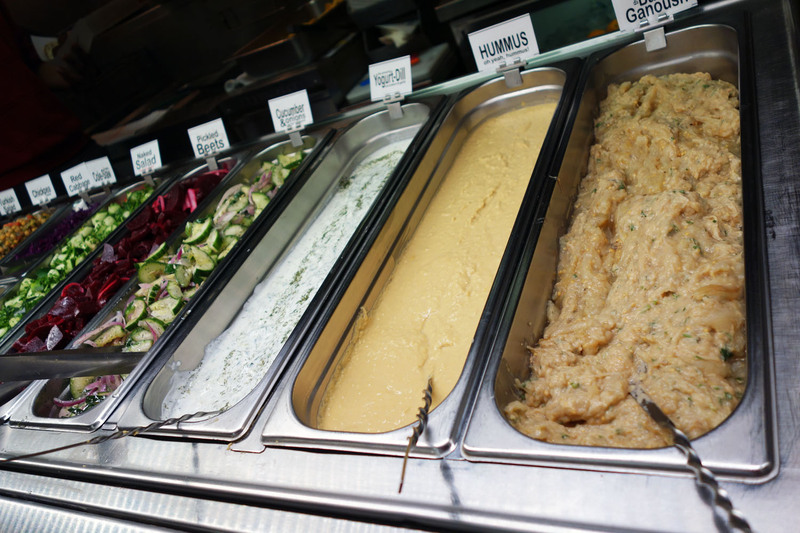 There’s a creamy, smoky baba ghanoush, nutty hummus and zingy tzatziki-like dill yoghurt as bases. 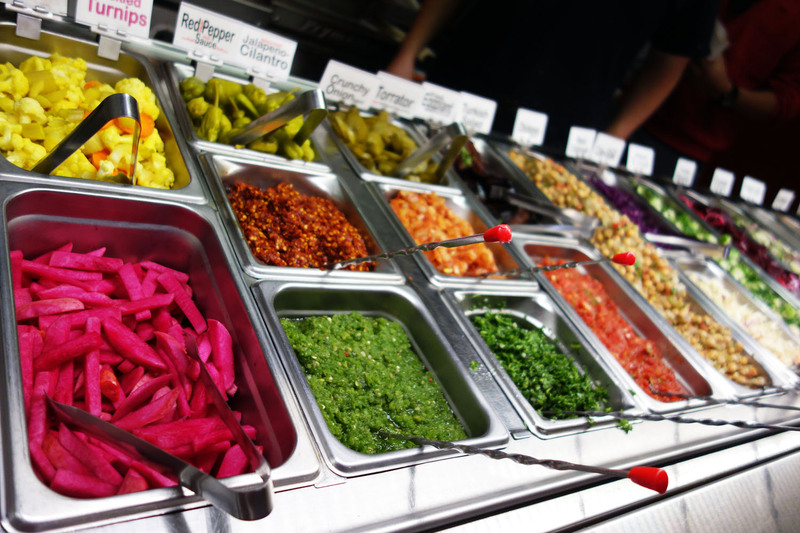 There is also a tart salad of red onions and cucumber wedges, along with earthy pickled beets, red cabbage, cole-slaw, and a chickpea salad for those needing a bit of extra chickpea in their meal. Crunchy, tangy toppings include bread-and-butter pickles, a crunchy red onion salad, peperoncini, pickled turnip wedges and pickled cauliflower. For a hint of spice, add one of two spicy chile spices: a red chili spice or a jalapeño. 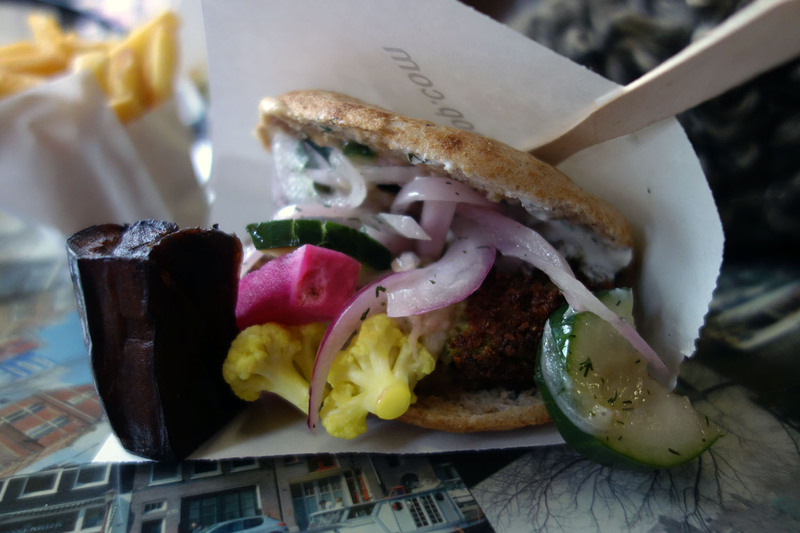 And the falafel itself? Crunchy coat, mushy and starchy filling. It was bright green inside with a beautiful hardened brown shell, with ridges like the surface of the Moon. I bit into one, without topping, to test the quality and it passed my rather undefined expectations with flying colors. 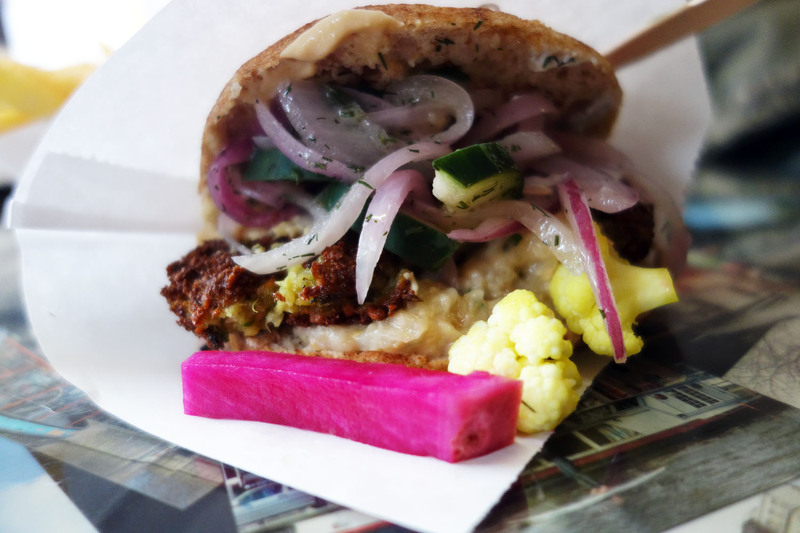 The man behind the counter gave me a tip on how to most optimally smother the three little lumps of chickpea: Smash the falafel between slices of pita with two palms to let out the air and free up space for toppings. I did just that, though I rather regret it now – biting into the fritters whole was a nicer experience. Feeling that crunch and the gushing out of creamy, thick chickpea filling was wasted in squeezing them. The wheat pita was fluffy and flavorful, firm enough to hold the fillings I would pile on. My friend went the “smothered” route and topped her falafel with chickpea salad and creamy, smooth hummus for a sort of triage of chickpeas. It was delicious this way too, though it turned out a bit too soupy for me. I went with a solid layer of baba ghanoush on one side of my pita pocket and hummus on the other. Although both were wonderful separately, they mixed and this resulted in an unfortunate confusion of flavors. When I return I’m probably going to stick to one base sauce, but the first time I really just wanted to try one of each type of bite. I added plenty of tomato and cucumber salad which, I was excited to discover, was flavored heavily with dill. Tangy, crunchy and cool against the mashed, nutty chickpea – the perfect contrast to the latter. I also tried some of the fried eggplant chunks and bright pickled turnip, though I think these were more enjoyable eaten on the side. 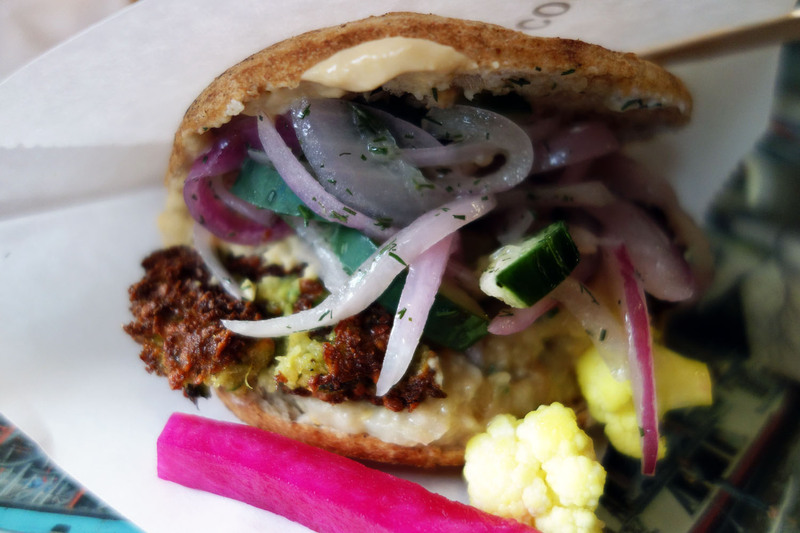 Maybe if I had composed a falafel-baba ghanoush-fried eggplant or falafel-tzatziki-pickled veggies sandwich it might have made more sense in terms of flavor combination, but this kind of thing takes being a regular to perfect. I fell into the first timer trap and got a little bit of everything, even though they did not harmonize at all. Nevertheless, I could tell the ingredients were fresh and packed with flavor. It’s really just about combining them in an appropriate way. Next time, next time…. 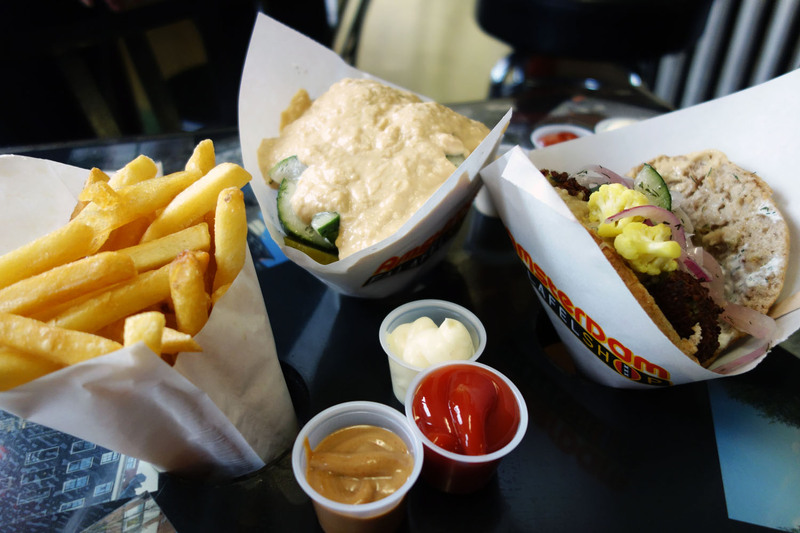 The fries come with almost as many options as the falafel. 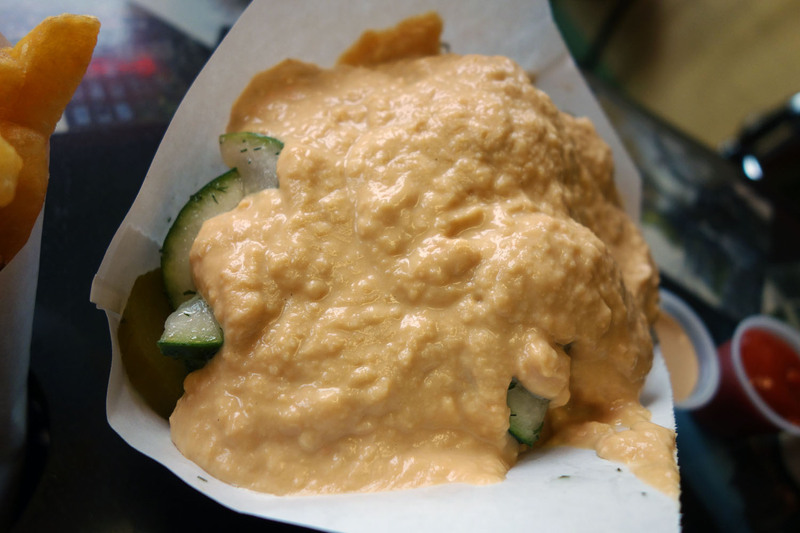 There is regular mustard and creamier, citrusy Dutch mustard, regular ketchup and curried ketchup, tahini and – everyone’s favorite – peanut sauce. There was also a smoky garlic mayonnaise which was what I ended up using most of. The fries themselves were just okay, not as beefy and crisp as I would have expected them to be, especially considering they were self-proclaimed Dutch-style. But what was left in my cone by the time I got to my table was okay when dunked head-first into and smothered with the dipping sauces. I imagine at 3:00 a.m. this experience is not just enjoyable but downright life-changing. I got a great b-day meal and exactly what I wanted at Amsterdam Falafelhouse. It passed the “slightly hungover and pissed off” test, so I’m sure it would soar high if I ever tested it drunk, especially if that meant deterring friends from Jumbo Slice in the process. A colorful, varied, complex meal, one that I found especially impressive in that it kept me interested despite the meal being 100% vegetarian. Living near Adams Morgan has had many perks and Amsterdam has, for me, become another one. Open until 4 a.m. Friday and Saturday? Why would I go out anywhere else? February 19, 2014 in WASHINGTON D.C..